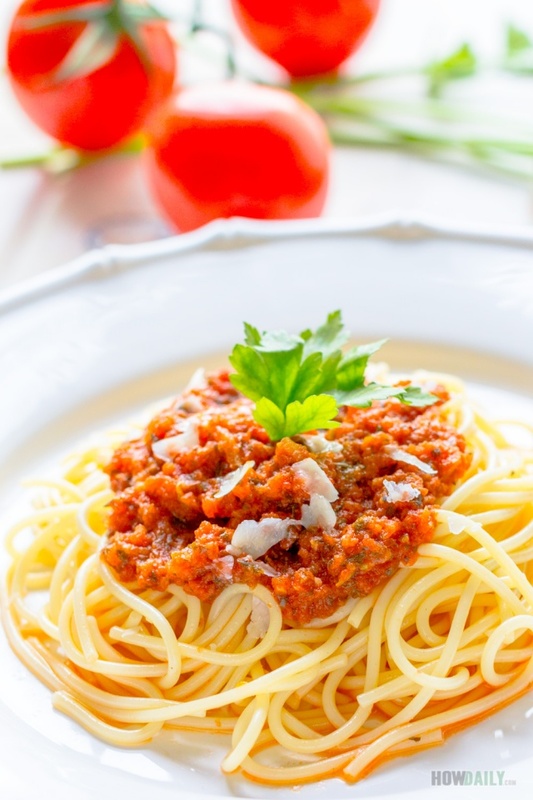 I love Italian food, among them my all time favorite is spaghetti, and among all those various spaghetti sauce, I just fell for the simple marinara made from tomato and savory ingredients. 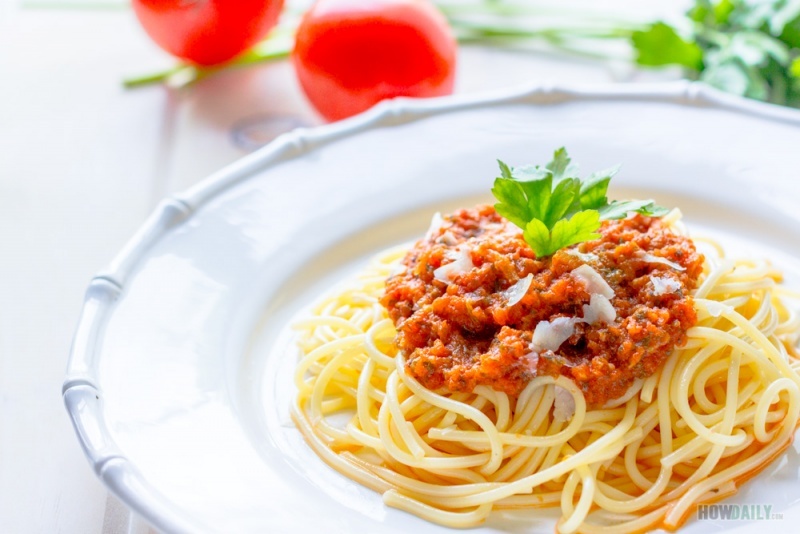 These days you could found pasta sauce at every grocery store, they are made from various brand with wide range of flavors and styles. Those are great to store for those quick, short meals. 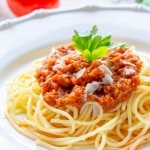 All you have to do were boil the pasta/spaghetti, warm the sauce and throw in some meat like sausages or meatball. Top them with some grated cheese and voila. Still, even though I’m not that picky, and don’t mind that those store bought pasta sauce have that special “cure” taste in them, somebody does. So when I have some spare times and when we have overflow ripen tomatoes in our backyard, it’s time to make that special spaghetti sauce. Yup, you heard that right, let’s make spaghetti sauce from all scratch, no can, no store bought. Don’t worry, it is not that hard, and doesn’t took that long either. You can make the sauce as recipe below, use it immediately or double (I always triple) it then store in ice cube tray for easier future usage. If you’re into canning, then you could can them too but I prefer freezing method personally. Most of the ingredients are fresh and ready from my garden except for honey and oil, of course. Oh, don’t forget the cheese! I just love that cheese, and throw in a cup of your favorite wine too. They smell so great altogether. Let’s get ready, shall we. A detailed walk through of the marinara sauce, an all natural, made-from-scratch and fresh home made version of the ever favorite Italian spaghetti sauce. Bring a large pot of water to boil over high heat. Also prepare a bowl of icy-cold water. 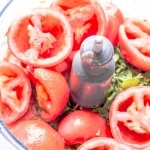 Remove the stems from tomatoes (if any), then use a the tip of your knife to mark an X on the bottom of each tomato. 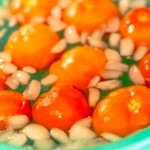 Carefully drop them all into the boiling water, heat for 30 seconds, not too long. 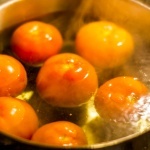 Remove tomatoes from boiling water and transfer them to the prepared icy cold bowl. This should make the skin falling right off when you start peeling. 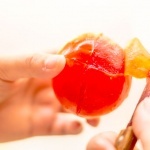 Peel all the skins off the tomatoes, cut into halves and remove seeds. Throw all tomatoes flesh into food processor and puree them. Control your texture of how thick or chunky you want your sauce to be here. I like mine creamy and mushy so, yeah puree. Peel the skin and cut carrot in to halves. Grate half the carrot, leave the other half till the very end. Thinly slice or chunk mushroom. Finely chop or mince oregano, basil leaves and some parsley. Place a large pot on medium heat and add the olive oil. When oil is hot, add minced garlic and diced onion, stir until onion become tender and translucent. Add grated carrot, puree/chunk tomatoes, bell pepper and stir well to mix. Turn heat down and let simmer for about 5 minutes to vaporize some excess water. Add all the herbs: oregano, basil, parsley, bay leaves, etc. to pot. Also add 1/4 cup red wine to pot, stir well and let simmer. While uncover, simmer at for an hour then cover and simmer for another hour and stirring in between. Remove the whole carrot piece and 2 bay leaves from sauce, be careful, it's hot and may splatter. Then Add sliced mushroom (if use) and cheese in, stir well and simmer for 5 minutes or until all cheese melt and mushroom's done. Finally add 1 tsp of honey (or skip this if you like the natural sweetness) and a sprinkle of ground black pepper. Stir well and remove from heat. The sauce is ready to serve or can be freeze for later uses.